Andritz Separation has developed a new generation of decanter centrifuges, allowing dewatering of fine or ultrafine coal in a continuous process, among other processes, and focusing on flexibly meeting customers’ requirements. The key advantage of the new centrifuges is the concept of scalability. This allows maximum flexibility in adjusting standardised machines to meet individual customer challenges without the risks and costs associated with customised prototype solutions. The large range of parameters on offer enables customers to choose capacities from small to large, temperatures from -80°C to +180°C, pH-values from 1 to 10, and pressures of up to 6 bar. The decanter centrifuges can be used for slurries or sludge in the feed – from thin solids concentrations to streams with a heavy solids load – and can process many different kinds of slurries. The new machines are also suitable for a wide range of atmospheres, ranging from harmless to hazardous. 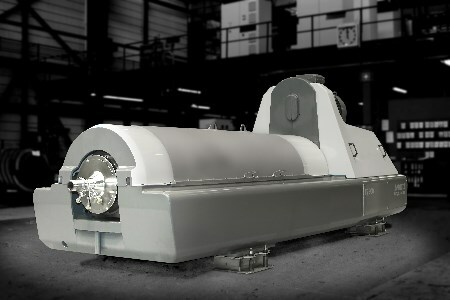 The ideal complement to any decanter centrifuge is the Andritz CentriTune centrifuge control system. Centuries of centrifuge and process experience are packed into an easy-to-operate machine interface that is simple to integrate into existing or new plants; this ensures a short start-up time thanks to full factory pre-testing. It is also simple to adapt for future plant expansion due to the modular PLC system with long-term availability of spare parts. The result is higher machine availability and better performance by using the verified control package for every centrifuge-related functionality.